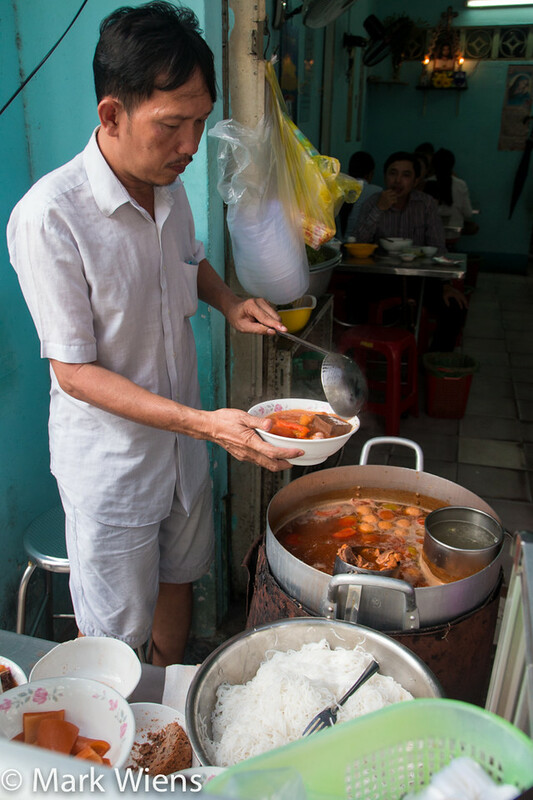 It’s nearly impossible to walk more than a few steps without bumping into the next noodle soup restaurant or food stall in Vietnam. Before spending time in Saigon, I only really knew about a few of the most famous noodle soups, like pho. 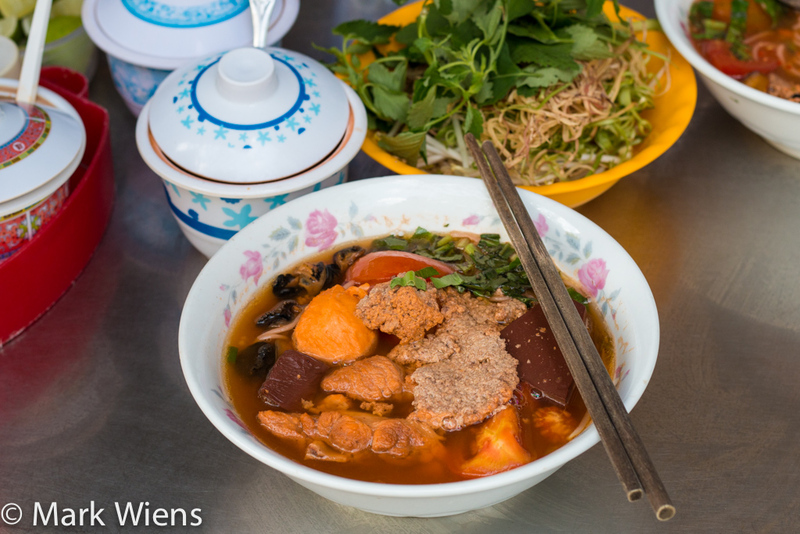 But while I was in Saigon, I had a chance to try many more noodle soup dishes, like the widely popular Chinese Cambodia noodle soup, and what quickly became my favorite Vietnamese noodle soup dish: bun rieu. 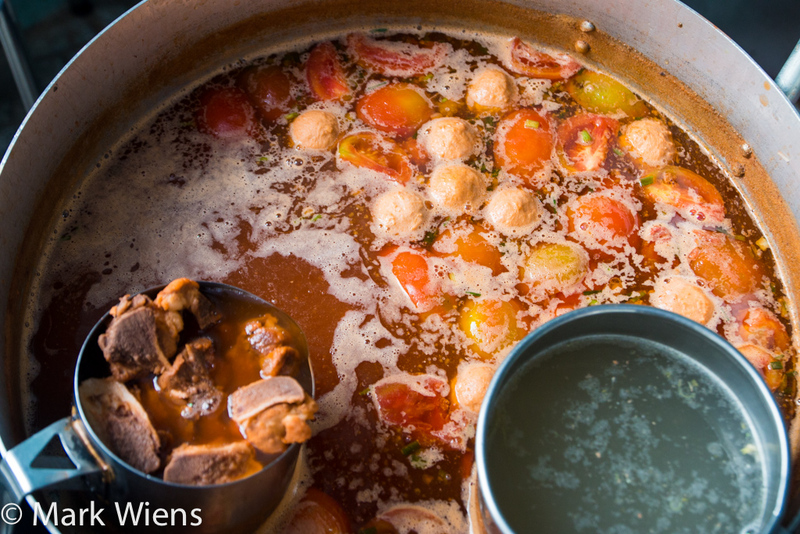 What is Vietnamese bun rieu? 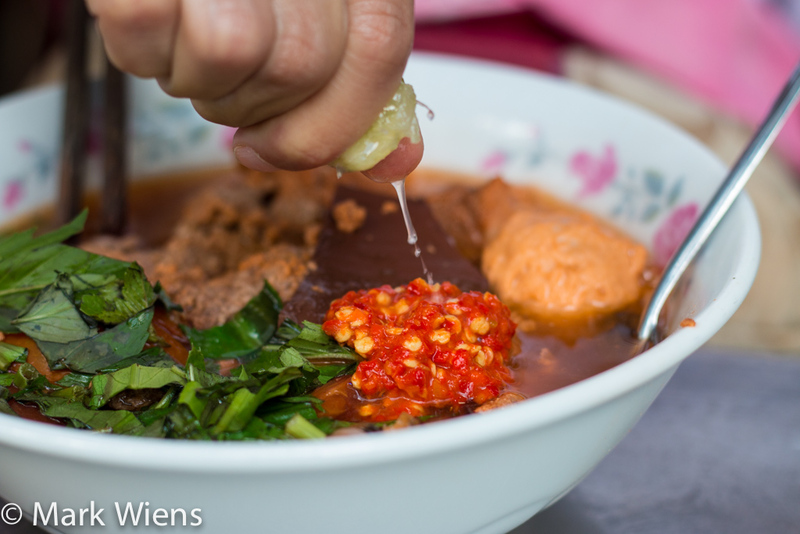 Bun rieu (bún riêu) is a Vietnamese crab based soup noodle dish. There are a few different types of bun rieu, but I had bun rieu cua, the version with crab, tomatoes, pork, and some pieces of tofu as well. The complex mixture of ingredients and flavors in the broth, paired with rice vermicelli noodles, pieces of meat and crab paste, a beautiful selection of condiments like shrimp paste, chilies, and limes, and finally a pile of both blanched and raw vegetables, is what makes the dish so delicious. 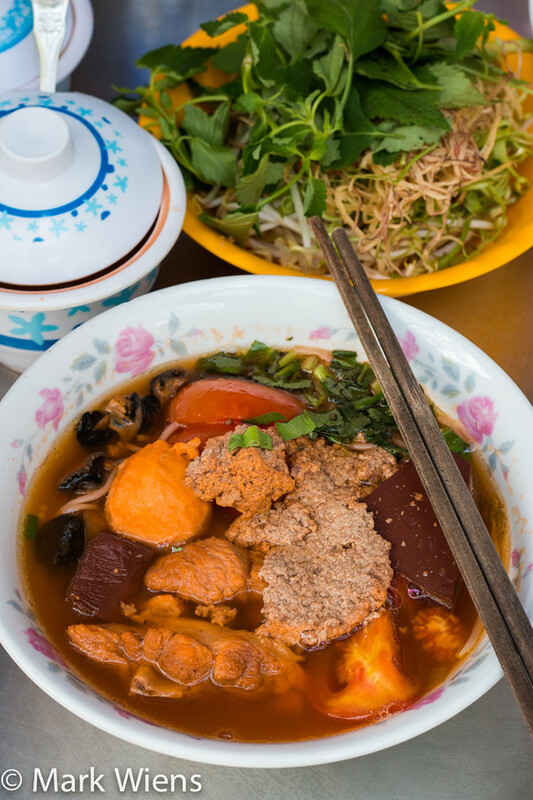 When it comes to Vietnamese noodles soups, of which there are many to choose from, bun rieu, is an absolute gem. 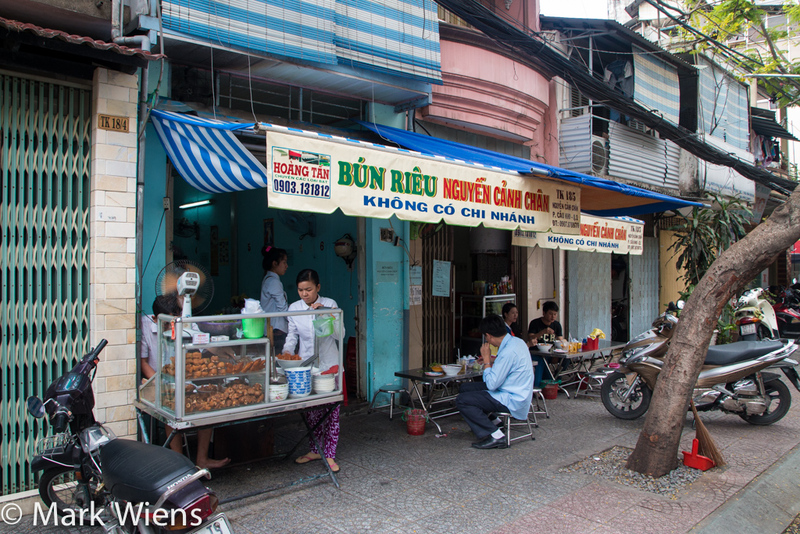 About a 20 minute or so walk from the Benh Thanh market area, and just a few streets down from the bun thit nuong restaurant, is Bún riêu Nguyễn Cảnh Chân. Bún riêu Nguyễn Cảnh Chân was a restaurants recommended by Linh Pham on YouTube (if you’re reading this, huge thank you), who said it was a favorite spot in Saigon to eat bun rieu. As soon as I approached the restaurant, I immediately got a whiff of crab, which came mixed with a tomatoey aroma, and I could not wait to order. 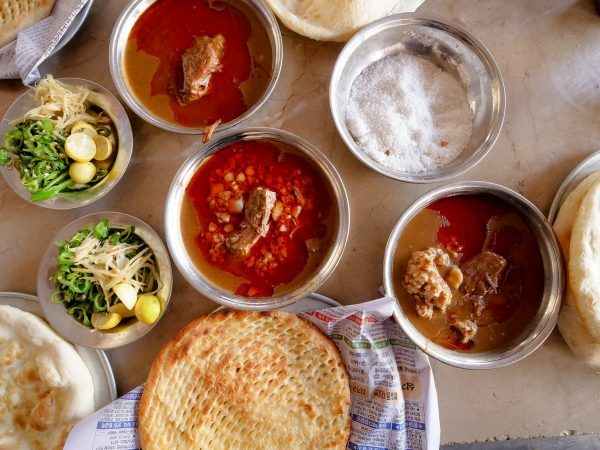 At the front of the restaurant was a cauldron of slow, constantly simmering, bones and tomatoes and meatballs, slightly bobbing, and just waiting to be dished out. I ordered a bowl of bún riêu cua, the crab version of the dish, and what Bún riêu Nguyễn Cảnh Chân is most famous for. The kind owner of the restaurant expertly blanched some rice vermicelli noodles, and added them to a serving bowl, before reaching into the simmering pot of soup to fish out some meatballs, tomatoes, and broth, and then topped it with all sorts of crab goodness. For the protein in this bowl of bun rieu cua, he added some hunks of tenderly stewed pork (which literally fell off the bone), blood jelly, some type of snails or shell fish (I think maybe they were periwinkles? ), and some slabs of crab and shrimp roe and paste. It was truly a beautiful bowl of noodles to look at. I think this was sour tamarind sauce? 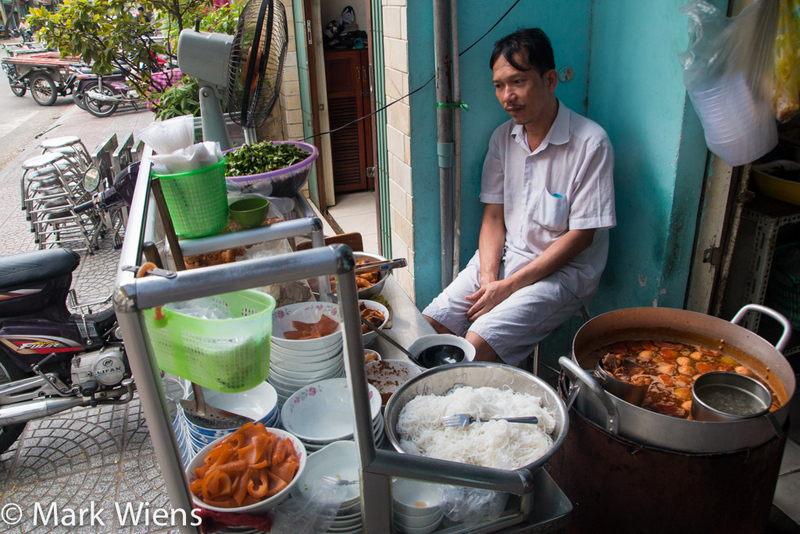 Once you get your bowl of noodles anywhere in Vietnam, only half the preparation is complete. It’s then up to you to doctor it up, flavor it with any and every sauce and condiment provided at your table (just be sure to taste the soup on its own first before you start adding). This sauce was mostly what I think was sour tamarind, slightly sweet but mostly sour, with a fruit raisin flavor. I’m a huge fan of the sour flavor of tamarind, and I really like my noodles sour as well, so I added a generous amount to my bowl. 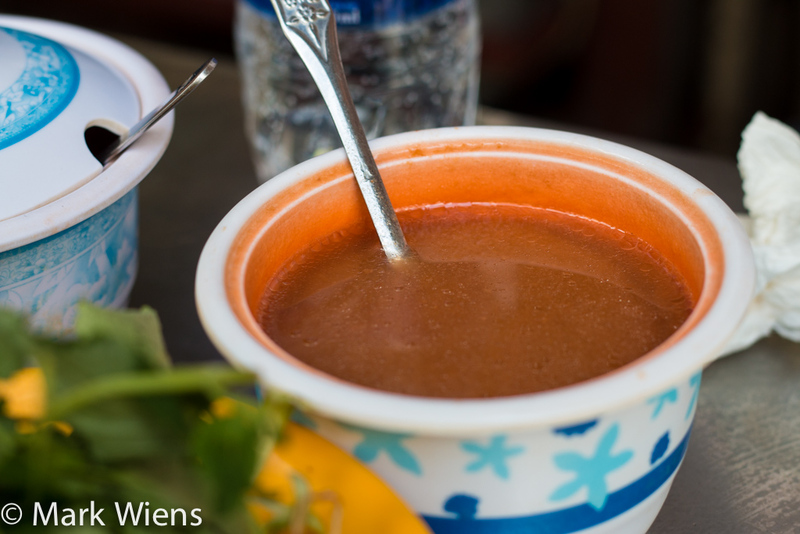 Another one of the main condiments for any bowl of Vietnamese bun rieu is something called mam tom, which is fermented shrimp paste. Shrimp paste has quite a strong smell, but used in small amounts, it provides a wonderful seafood essence and saltiness without being too fishy. 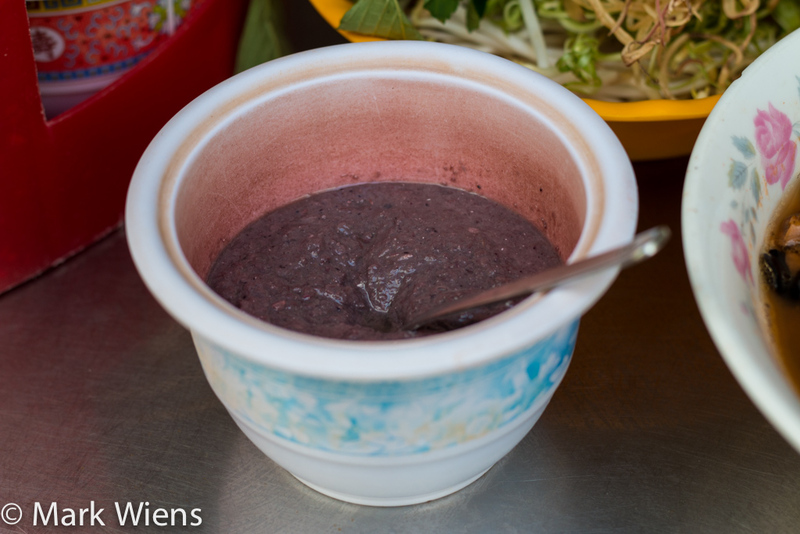 Shrimp paste is used in the cooking of many dishes throughout Southeast Asia, like in southern Thailand where it’s used in nearly every dish, but seldom do I see it just served on the table as a condiment. It was mild, but really good quality with a lovely flavor. Finally, no bowl of noodles is ready for me to eat without chilies and a few squeezes of lime juice. The red chilies were crushed and juicy, adding heat and also a littles sourness to the noodles, and lime juice is always good in just about everything. After giving my bowl of bun rieu a little mix with my chopsticks, I was ready to dig it. 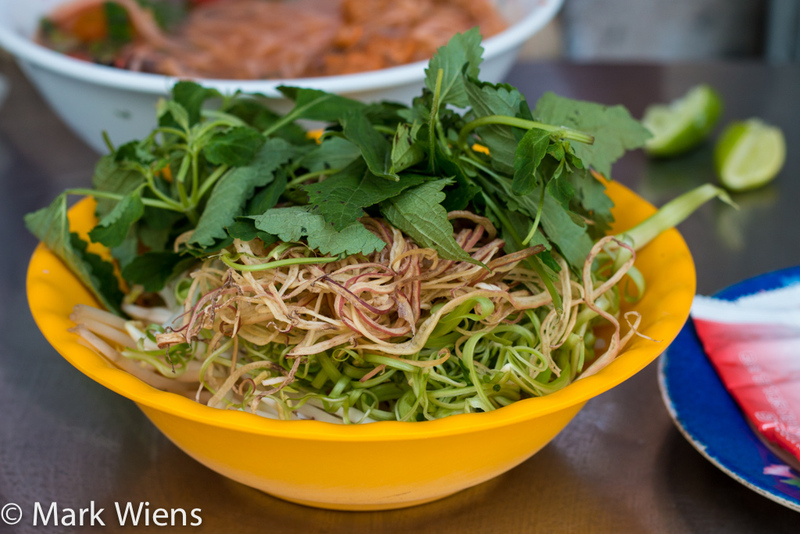 The rice vermicelli noodles were about the size of spaghetti, not really soft or silky like some other Vietnamese bun noodles, but a little more chewy. The broth, even before I spruced it up with all the condiments, was wonderful. It was light yet with well rounded flavor, not too oily, but tart and sour, a tiny bit sweet, and spicy from the addition of fresh chilies. A few slurps of noodles and after tasting the slab of crab paste (which may have been crab roe), and tasted like the most beautiful crab butter, I moved in to the final component of any bowl of Vietnamese soup: vegetables and herbs. On the bottom of the bowl there were lightly blanched bean sprouts, followed by finely shredded water spinach, banana flower, and peppery perilla leaves. After adding the veggies, I scarfed down my bowl of bun rieu cua pretty quickly because it was good, so unfortunately I didn’t take any mid-bowl photos. But what I can tell you is that it was one of the most satisfying and flavorful bowls of noodles I had in Saigon. Bún riêu is a type of Vietnamese crab noodle soup, and when I was in Saigon, I went to a restaurant called Bún riêu Nguyễn Cảnh Chân to try it out. My bowl of noodles came stacked with crab paste, and hunks of pork, all swimming in a light red colored tomatoey broth. The mixture of toppings and the tangy broth, along with all the condiments and fresh garnishes was extraordinarily delicious. 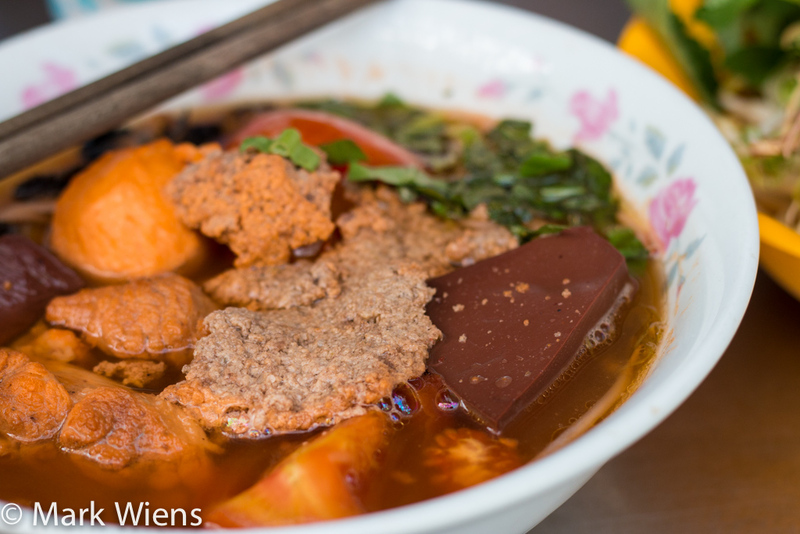 If you want to eat a stunning bowl of bun rieu in Saigon, this restaurant hits the spot. 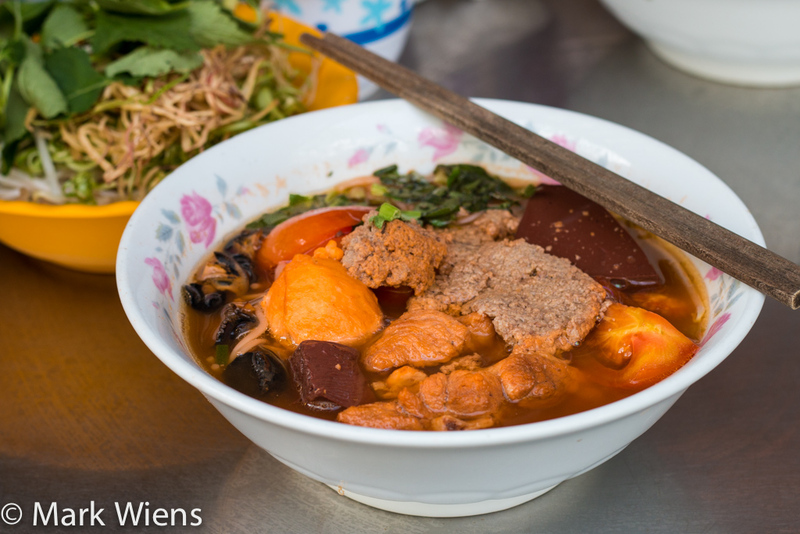 Out of all the foods I ate in Vietnam, bun rieu was one of my favorite noodles dishes. Just as the name of Bún riêu Nguyễn Cảnh Chân suggests, it’s located on Nguyen Canh Chan street in District 1 of Saigon. To see it on the map, click on “Bun Rieu Nguyen Canh Chan and it should highlight the position. 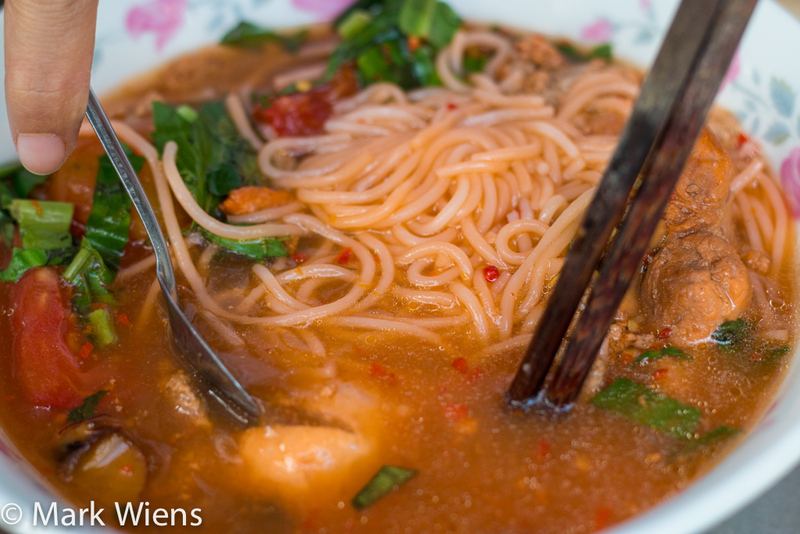 What is your favorite Vietnamese noodle soup? 25 comments. I'd love to hear from you! 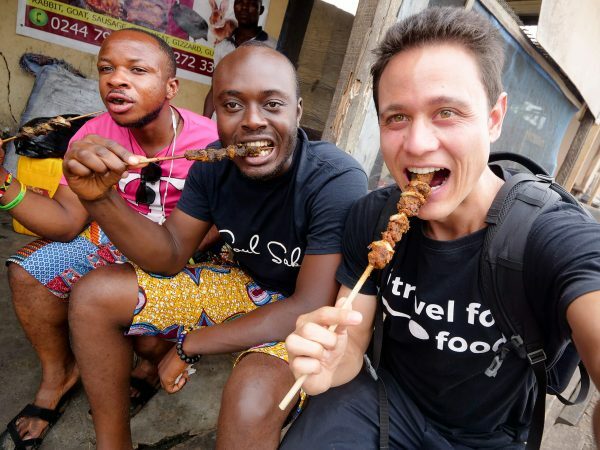 Love your youtube Channel – and since I moved to South East Asia I have been matching your videos to my travels so I can try these amazing dishes. I tried this one just two weeks ago in Hanoi on a business trip. I got a car to the old town in search of these and found a really amazing one – really deep red colour like those in this video. Absolutely amazing. Even better than Pho. 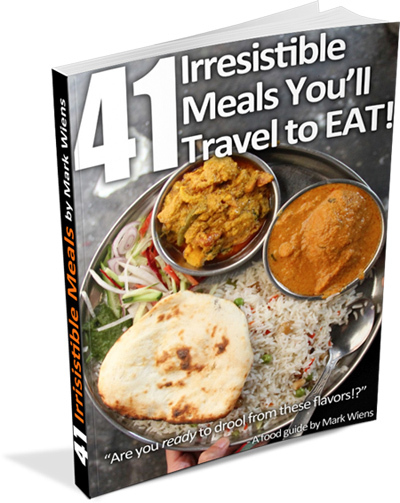 Keep up the amazing work – in fact you should host culinary trips – I would pay to come and eat with you for sure. You always find the most amazing foods. Thanks for sharing Vietnamese food tasting. I like the way that you are described how good is it and make me want to try it right now. Great work! When you try and find this place don’t just put the address in google map because what shows up is incorrect. You will end up in some small sub street that’s full of townhouses. You have to enter the address as TK18/5 Nguyễn Cảnh Chân to get the right location. Another thing, the lady will ask you which type of Bun Rieu you want. The standard bowl is 45,000 dong but you can add extra meat for another 40,000. We had 2 bowls of rieu (one with extra meat) and 2 bottled water and the total bill was around 140k+ or so. Seems high but the Bun Rieu was tasty for sure. Hey David, great, thank you for sharing your experience and the tip. Glad you enjoyed this bun rieu! Ate here after I arrived yesterday, definitely the best Bun Rieu I’ve ever had, better than the one at Bún Ốc Riêu Cua Thanh Hải. I can’t decide whether this is the best bowl of noodles I’ve had in Saigon or the bowl of Bánh canh cua from Bánh Canh Cua Trần Khắc Chân. Very cool to hear you enjoyed it, thanks for sharing! Have a good time in Vietnam. After I started reading your blog I have seen so many posts about different Vietnamese food. It just amazes me the variety of food plates you can eat there. And they all seem incredibly tasty, I can’t wait to get their and taste it myself. Hey Sigurdur, you’re totally right about that, there’s so much variety, and this is only in Saigon – there are so many other unique dishes available throughout other parts of Vietnam as well, this is only scratching the surface. I know you’re going to enjoy your time in Vietnam. Hello Jennie, great to hear form you, thank you and your family very much for watching our videos and blogs, my wife and I really appreciate it. I really hope you can go back to visit soon. On my next trip to Vietnam, I will try to visit Quy Nhon, thank you! This crab soup with noodles looks INCREDIBLE! Your photos, your write-ups and your LIFE is AMAZING! Hey Pomai, great to hear from you, thank you very much. Hope you’re doing well! Vietnam was not high on my list of travel destinations until I started reading this blog! Thank you very much Kailu, great to hear that. Oh the pics of the food look oh so amazing. 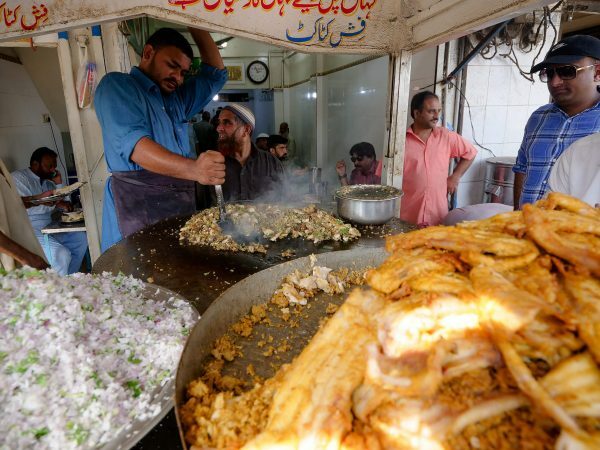 Definitely look forward to when I make it to have some authentic food. Glad to know that you love Vietnamese food. Just want to revise the Vietnamese word of the fermented shrimp paste that you wrote, it’s “mam tom”, not “mam ruoc”. “Mam ruoc is another different shrimp paste, same color, but different taste and smell, is used for different dishes in Vietnam culinary. Hi Loan, thank you very much for the help, I will change that now – I appreciate it!